Our partner supplier Huhtamaki has launched an initiative aiming to increase cup recycling within the UK. Whilst enjoying a brand new, modern design on their range of Specialty Cups (single wall hot cups and paper vending cups), consumers will also notice a message to ‘please recycle this cup’ and a QR code that can be scanned by a mobile phone which will lead the consumer to a web page which contains details of the growing numbers of cup recycling sites and schemes across the UK. The Huhtamaki website will be constantly updated whenever a new recycling scheme is available and will be a crucial point of contact for consumers and businesses as they aim to increase their own cup recycling activities. Aside from recycling scheme updates, the Huhtamaki website is a great source of information on all aspects of cup manufacturing and recycling, including explaining more about Huhtamaki’s commitment to sustainable manufacturing. The new designs on the Specialty Range also feature iconography to highlight that all the wood fibres used in Huhtamaki’s UK-made cups come from sustainability managed, PEFC certified, forest. The range continues to offer the same sizes of cups as before so customers can be sure of the same great offering from Huhtamaki but with increased features to appeal to their consumers. For further information on the new design Specialty range, please contact Bunzl Catering Supplies today. 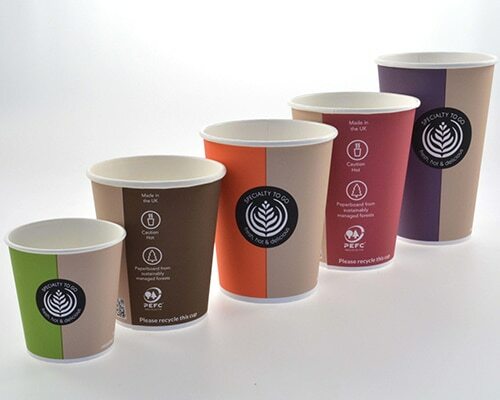 The world’s first reusable cup made entirely from used paper cups is available to the foodservice industry now.